Happy Father's Day!! You know Mentoring Mondays has been great for my blog, but even better for me personally. I have had the great opportunity to meet some fantastic people!! Today I am so honored to share some fabulous memories from some of my favorite people in the Disney cyber community. Thanks so much for allowing me to share these stories. HAPPY FATHER'S DAY!! As a single father, sometimes things tend to get a little hectic. I have a full time job and have two kids, Isabella (6yrs) and Joshua (13yrs). During school my mom helps me out by watching them. Being a parent, you look for things to do with your kids, things that will make your children happy.The first time I can remember knowing about Disney World was when I was nine years old and saw a commercial about a new ride they were getting. I also grew up watching Mickey Mouse every Saturday morning and when I found out there was a place to meet him and get a chance to go on rides I was hooked, that's without even going on a single ride yet or even going there. The problem was my family could never afford to take me there. They were not fans of Disney to begin with let alone being able to afford to take me there. At school, I would hear kids talking about how they are going to Disney World during Christmas and how awesome its going to be. It stunk that I was never able to go as a child. Fast Forward to 2002. I got full custody of the kids and everything they do now, would be my decision. Knowing how much I loved Disney you would think I would have taken then quite a few times by 2002 but I was never able to. But things change and I had a good enough job that finally i was able to take them every year from now on. Mind you , I only got the chance to go to Disney once before back in 1997 when my friend took me for 4 days. It was a dream come true, and from then on, I made a promise to myself that If i had kids, I would bring them there so they could have a great memory to have for the rest of their lives. I didn't take Isabella till this past Feb. We had a special moment that I would like to share with everyone. Isabella wasn't a real big Disney fan at all. Matter of fact, she watched Dora and Spongebob more then anything. But one thing she loved was pretending to be a princess and watching any princess on TV. I told her a month before our trip started that we were going to Disney World and would be meeting a real princess. She was kind of interested in the fact she would see a princess but having been to carnivals and other parks she wasnt really excited at all. Now, I have to remind you she has no idea what Disney World is. All she knew was that, it has rides, and there is a princess there. So our first day there I took her to the Magic Kingdom. She knew something was different. When we were at the gate, they had a huge welcome event. I noticed her face changed from being disinterested to being very intrigued. She started to smile and I knew right then and there this was going to be a memorable moment for both of us. As we started to go towards the castle, I was getting excited. I knew what was coming up, she had no idea what was in store. I slowly walked around and then, like a dream come true, she noticed the castle. I didn't say a word to her, I looked in her eyes and noticed that , to her, this was real, and her dream had come true. She jumped up from the stroller and gave me a hug and said "Daddy, its true the princess does live here!" Being able to watch the pure enjoyment of her was one of those moments you will never forget. Even though as a kid I never got to have that pure excitement, I was glad that me and her would always have this special moment together, the day me and my daughter's dream came true. I am very lucky to have a wife and 15 year old son who are tolerant of my Disney addiction. John, my son, actually tries to tell me that his addiction to X-Box is “just like your Disney addiction”. What he doesn’t realize I will never tell him is that mine is a lot worse. John is so tolerant of my problem that he contributes as an author to my website on Tuesdays and talks about his favorite things in Disney World and things that people should know about. I am lucky to have John. I met his mom when he was 8. When we started going to Disney World, I was excited to share it with them both, but I have been the lucky one. I have been given memories from Disney World that I would have never had if I wasn’t a father. When I was asked to contribute to this Disney Dad’s Day, I was and still am very honored and happy to share some of the things I will never forget. Like the look on John’s face when he found out he could ride the Walt Disney World Grand Prix by himself; that smile I hope to carry in my heart forever. Or the First time he ever beat me in a sports event; which also happened in Walt Disney World (on a tennis court at the Yacht Club). He was so excited he almost cracked his head open slamming himself to the ground. And another thing I will carry with me forever are the memories of our family trip to Disney in 2007, when we were there with his cousins, my sister, brother-in-law, and parents. John (who is an only child, who was being raised by a mother who was also an only child) spent that entire week loving the fact that he had family. He must have said about a hundred times, “It’s Great to have Family!” These are some Disney memories I know I am lucky to have and as a father, I hope John will remember them also. 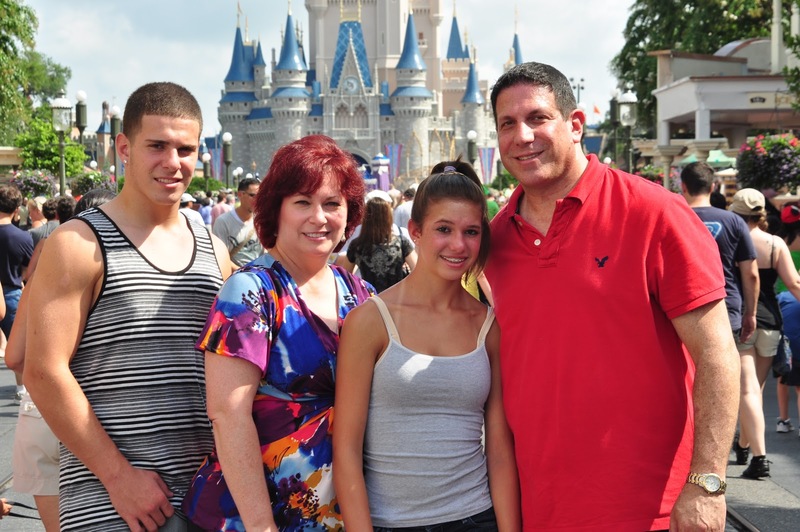 "Being a Disney Dad, or someone who takes his kids to Disneyland fairly frequently means I have a lot of great memories to choose from, but when I was thinking about it one really leaped into the front of my mind. We (the entire family) have been Annual Passholders for several years now, but there was a time a few years ago when, for financial reasons (and before monthly payments were an option), we decided not to renew for a while until things became more stable. We really missed having our passes, and the boys (my oldest two sons) were constantly asking when we were going to get them again. About 3/4 of a year after we had let them lapse, my wife and I decided we were back in good enough shape (and they had just installed the monthly payment program so not everything was due at once) to buy our passes again. We decided though not to do the right away, but rather we waited until the day that the boys would be out of school for the summer. I surprised them myself by picking them up from school (they had no idea what was going on), and I drove them out to Disneyland myself to renew all of our passes and spend the rest of the day there, just the three of us (me and my two oldest sons). It was one of the best days we've ever had there as we spent the entire day riding attractions and we even stayed for fireworks that evening. Now, it would just be a typical day at The Park for us, but on that particular day, and since, they've told me repeatedly "it was the best day ever" since I surprised them the way that I did and they were able to just have "Daddy Time" with me. It helped that particular day be just a bit more magical for all of us, and it's indelibly etched in my memory and always will be. It's one of my favorite memories of me and my kids and I'll remember it always." All but two of my trips to Walt Disney World have been with my wife and children and each family vacation their holds a special place in my heart. Watching my kids experience the parks at different stages of their life makes each visit a wonderful and new experience filled with memories to last a lifetime. On our last family vacation to Walt Disney World my wife and I allowed our kids to experience the Kim Possible Adventure on their own. We met them after for dinner and both my kids couldn’t stop talking about their experience. Even though I wasn’t with them for the Kim Possible Adventure I felt like I was because their enthusiasm was extraordinary and I felt their excitement as if I experienced it with them. As mentioned in Donna Kay’s mentoring Monday’s my very favorite Disney experience occurred during our June 2001 Disney family vacation. My son was 8 and my daughter was 5. We were in Disney’s Hollywood Studios formerly known as Disney MGM Studios waiting to meet up with my brother and his family. While we were waiting for my brother’s family Snow White came out of nowhere and walked right over to my children. She was so warm and friendly to my kids. They were so excited to talk to Snow White and as a parent seeing their joy at meeting a Disney princess was about as magical a moment that a dad could ever ask for. Loved it! So humbled to have been asked to participate. Thank you so much again! Hey there, Disney Dads! I've "met" so many of you via Twitter, FB, and of course, blogs that I feel I already know you! But thanks to you, Donna, I know them just a little bit better now! Thanks and Happy Father's Day, Guys! Great way to honor these Disney Dads! Bruce, I believe I teared up a bit reading yours :-) You and John are so very blessed to have each other! I'm a day late, but Happy Father's Day, Fellas! Thanks so much guys! I am so honored to have been able to share your stories here. You are all remarkable dads and your families are lucky to have you. I am incredibly luck to be able to call you all friend!! Thanks Manda! You are so sweet to always visit my blog. :)This is a great group of guys, I'm just lucky they agreed to do this for me.